You'll be £4.99 closer to your next £10.00 credit when you purchase Hitler's Jet Plane. What's this? Hitler's Jet Plane was the first operational military jet in the world, towards the end of the Second World War the ME 262 was to be the German 'miracle weapon'. Mano Ziegler was involved from its inception and contributed to the design, testing, training and even served in it operationally. Could the ME 262 have broken the Allied supremacy in the air? Why did it take so long to come into service and why were hundreds of German pilots sacrificed in developing it? Why did the ME 262 prove not to be the unparalleled success claimed by Goering and why were German cities left dangerously exposed against Allied bombing campaigns? These are only some the important questions this new book answers. Mano Ziegler, born 7 June 1908, had a lifetime fascination with flight. At the age of eight, he wrote to Manfred Freiherr von Richthofen, the famous 'Red Baron', asking to be allowed to fly with him. Richthofen even replied, telling him, 'Yes, we'll fly together!'. When war broke out in 1939 he became a pilot in the Luftwaffe, and from 1943 until the war's end he flew the Me 163 . After the war he escaped from Russian captivity and - having returned to Berlin - continued to fly and write newspaper articles. He eventually became editor-in-chief of the Flug-Revue aviation monthly in Stuttgart . Hitler's Jet Plane fills an important gap in the history of the Luftwaffe and of aviation in general with new research which dicloses how the first ever military jet plane failed to make its mark on World War II. Written by someone who was closely involved with its design and testing. The ME 262, the first military jet to enter service, was amongst the most significant of Adolf Hitler's so-called "miracle weapons" which were to save the Reich. The author of this book is well placed to tell the story of this famous aircraft as he not only flew it but helped to design it. Consequently we are treated to a most comprehensive account of the ME 262, from the initial development stages through to its belated entry into service during the final months of 1944. Ziegler correctly focuses on the reasons behind this late arrival as it could have reached the front line much earlier, and may well have had a significant impact on the efforts of the Allies to win air supremacy over the continent. Yet Hitler's peculiar conviction that it should only be developed as a bomber, rather than the fighter which it quite clearly was, resulted in it only coming into service once that battle was effectively over. Despite numerous successes, the Luftwaffe's dwindling resources and pilots were faced with the insurmountable, and it became apparent that even a miracle weapon could only do so much. Mano Ziegler had a fascinating life. He was a member of Germany's Olympic high-diving team in 1936, he was a test pilot for the 1st German jet fighter planes, flew the ME 262 and went on to a successful career in journalism. 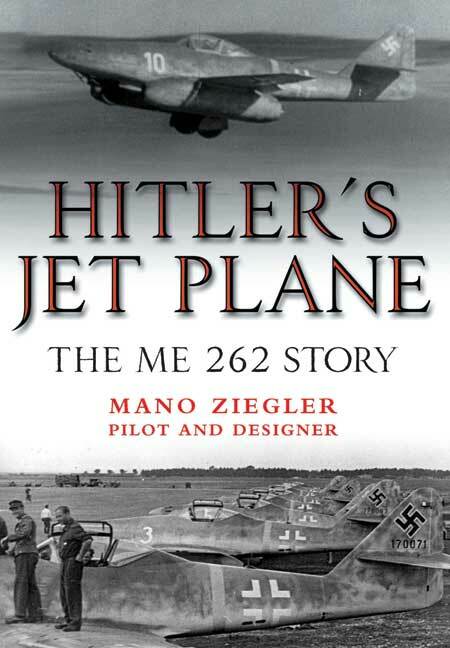 Hitler's Jet Plane is an absorbing book because of the main question it asks, would the Luftwaffe have been victorious had the ME 262 become fully operational earlier? The obvious answer is; we will never find out, but it does seem likely that the outcome of the war would have been somewhat different.